We carry a variety of performance jet boat parts and pumps, marine engine parts, and marine exhaust systems and silencers, including all the accessories like billet aluminum hardware, marine gauges, foot throttles, and steering wheels. Take advantage of our experience and knowledge and contact us today for all your needs. 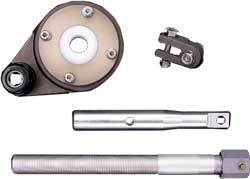 Steering set back install kit contains a transom bezel, steering tube, steering extension, clevis, & a cable packer. All aluminum parts are made from billet aluminum and are anodized. 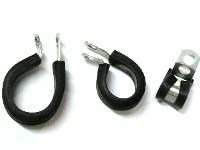 Can be used with -8AN fittings, PVC or rubber hose. Highly polished. They Include Stainless Studs,Nuts&Washers. They have a black porcelain-like coating. This flip top gas fill is designed to be connected to the tank with 2” I.D. Hose. The cap has a quick release spring and a leak proof filler. 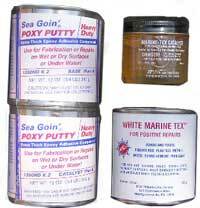 Sea Goin’ Poxy Putty Great for setting Jet drive intakes in jet boats. Will dry under water. 3-lb Kit. 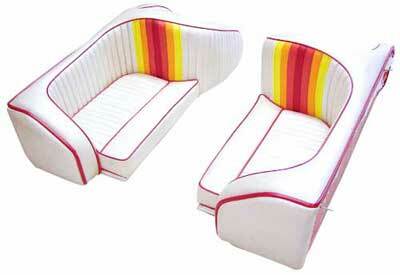 We build custom fiberglass seat shells by hand. Shells are constructed of fiberglass & wood. We use marine grade vinyl with a special UV Protectant. 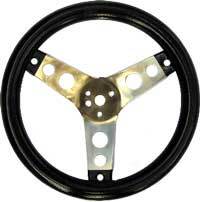 Three spoke dished steering wheel. Rim is double dipped foam. Spokes are bright chrome. The perfect wheel for competition or Color is black. Waterproof and dustproof with protective neoprene cap. 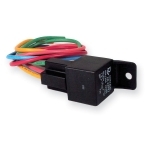 Rated 35 amps @ 12 volts. Snap-off cap releases in full 360° circle. Recognized by all major boat racing associations. Automatically allows water to exit your boat while under way. Closes with water pressure when stopped. Plug measures 2" X 2". Liquid Filled 2" Diameter Test Gauges. Stainless Steel Case. Bottom Mount. For use when checking Engine block pressure or checking Jet pump pressures. Liquid Filled 1-1/2" diameter gauge. 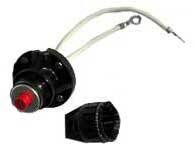 1/8” centered NPT back mount. Machined, engine turned dial with black pointer. Glycerin filled for vibration protection. Choose from 0-15psi, 0-30psi, 0-60psi, and 0-100psi. Fits 33c or 43 series cables. 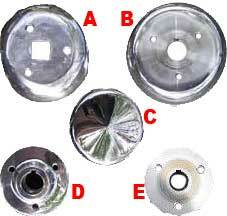 Used on American Turbine diverters. Male bosses for 3/8" turn buckles. Precision machined chrome plated brass. 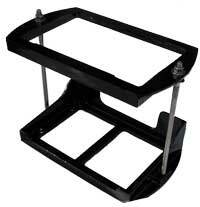 Designed to prevent blown head gaskets or leaking head gaskets particulary in JET boats. Allows you to add up to 20' degrees to your operating temperature. Maintains full water flow to engine, bypassing to a thru-transom fitting if pressure becomes excessive due to high RPM. 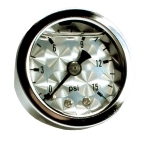 Mount the pressure gauge on the block to monitor water pressure in motor. A good recommendation for pressure would be nothing over 15psi @ w.o.t. (hose not included). Designed to prevent blown head gaskets or leaking head gaskets particulary in JET boats. Allows you to add up to 20' degrees to your operating temperature. Maintains full water flow to engine, bypassing to a thru-transom fitting if pressure becomes excessive due to high RPM. Mount the pressure gauge on the block to monitor water pressure in motor. A good recommendation for pressure would be nothing over 15psi @ w.o.t. (hose not included). 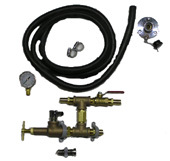 Also included is a Bulkhead garden hose flush fitting,a ball valve & a one way bypass valve. This is a nice complete kit for saltwater jet boats. Allows you to permanently mount a female hose adapter fitting anywhere!